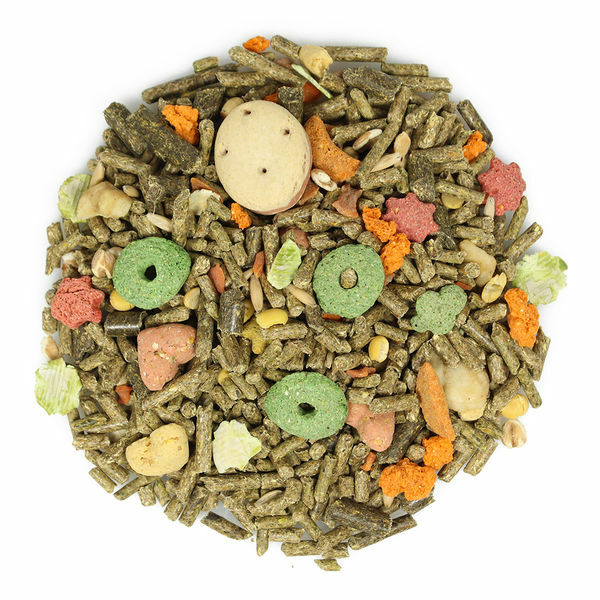 An enriched foraging diet that provides guinea pigs with a convenient and fun, all-in-one gourmet meal. 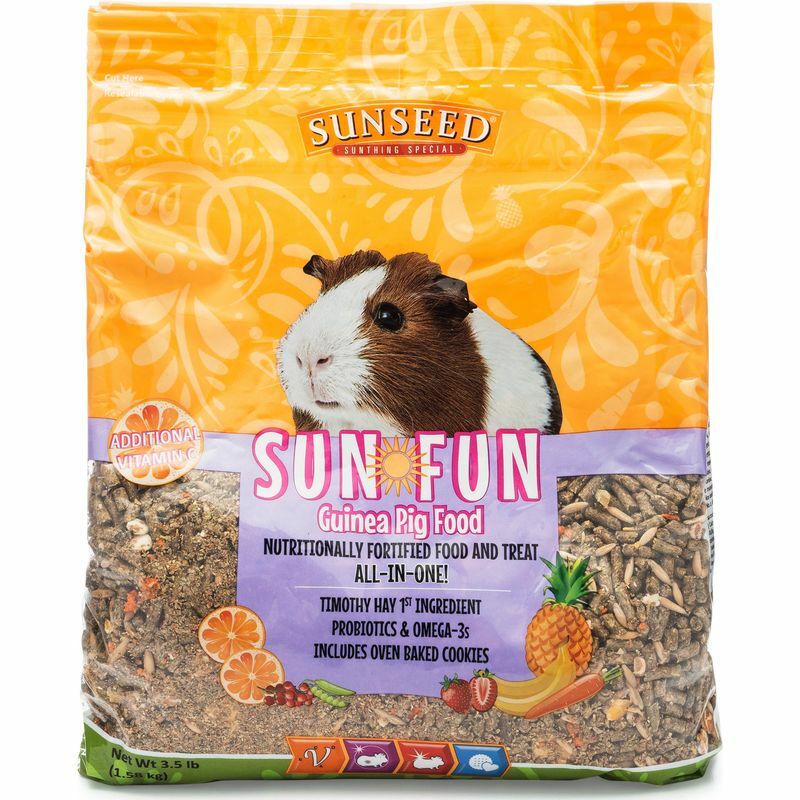 With special oven baked cookies and timothy hay as its first ingredient, Sun-Fun® offers your guinea pig both delicious treats and essential nutrition. 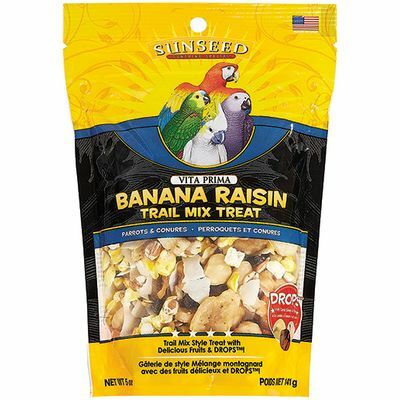 The ingredients create a three-course meal--an appetizer (fruits and veggies), dinner (fortified nutrients), and a dessert (oven baked cookies)--full of interesting textures, colors, and uniquely shaped pieces that your guinea pig will enjoy exploring. Amounts to feed will vary according to guinea pig's age; see recommendations below. Fresh, clean water and hay should be available at all times. Store unused feed sealed in a cool, dry place. Provide feed in a heavy feeding bowl. Young guinea pigs (0 to 6 months old) should be fed up to 1/8 cup or as needed. Adult guinea pigs (6 months + older) should be given 1/8 cup. For juvenile, pregnant, or lactating guinea pigs, we recommend supplementing this diet with alfalfa hay. We recommend timothy or orchard grass hay for all other healthy adult guinea pigs. Ground Timothy Grass Hay, Soybean Hulls, Dehydrated Alfalfa Meal, Dehulled Soybean Meal, Ground Corn, Wheat Middlings, Oats, Heat-Processed Soybeans, Ground Wheat, Flaked Peas, Puffed Wheat, Dehydrated Carrots, Corn Gluten Meal, Corn Distillers Dried Grains with Solubles, Dehydrated Banana, Salt, Yeast Culture, Corn Syrup, Dehydrated Pineapple, Ground Flaxseed, Calcium Carbonate, Vegetable Oil, Monocalcium Phosphate, Dicalcium Phosphate, Ground Oat Groats, L-Ascorbyl-2-Polyphosphate, Ground Strawberries, Ground Cranberries, Ground Oranges, Potassium Sulfate, Magnesium Sulfate, Dried Lactobacillus Acidophilus Fermentation Product, Dried Lactobacillus Casei Fermentation Product, Dried Enterococcus Faecium Fermentation Product, Dried Bifidobacterium Bifidum Fermentation Product, Dried Aspergillus Oryzae Fermentation Product, Torula Dried Yeast, Magnesium Oxide, Choline Chloride, Vitamin A Supplement, Vitamin E Supplement, Vitamin D3 Supplement, Yucca Schidigera Extract, Dried Parsley, Niacin Supplement, Vitamin B12 Supplement, Riboflavin Supplement, d-Calcium Pantothenate, Menadione Sodium Bisulfite Complex, Biotin, Folic Acid, Thiamine Mononitrate, Pyridoxine Hydrochloride, Zinc Sulfate, Zinc Methionine Complex, Manganese Methionine Complex, Copper Lysine Complex, Cobalt Glucoheptonate, Ferrous Sulfate, Manganese Sulfate, Copper Sulfate, Ethylenediamine Dihydroiodide, Sodium Selenite, Iron Oxide Color, Color Added (Yellow 5, Yellow 6, Red 40, Blue 1, Titanium Dioxide). 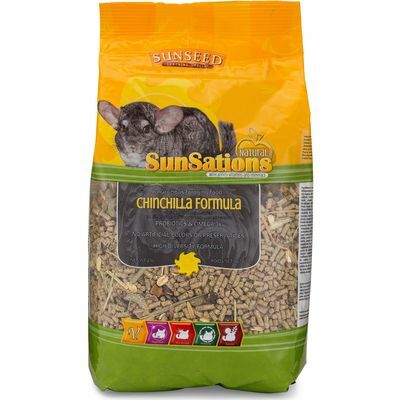 A natural diet fortified with key nutrients to help keep your chinchilla happy, healthy, and playful.